Once again we find ourselves, with just two days to go, supposedly leaving the EU. Except that once again our Government cannot tell us if we’re leaving or not. Seriously? Just think about it for a moment. We have all become so numbed by the absurdities prevailing in our nation’s political life that we sometimes forget to question the basics. Or perhaps we just can’t be bothered any more. The greatest change in the status of our country for many decades is supposed – according to law – to happen the day after tomorrow. And yet we simply don’t know if it will happen or not. Just think of all the lives, businesses, and agencies who are affected by this. The assumption by most people is that once again we will not leave on Friday. Almost the only thing on which Theresa May has been consistent is her inability to make a positive decision. If a can can be kicked down the road, it will be. 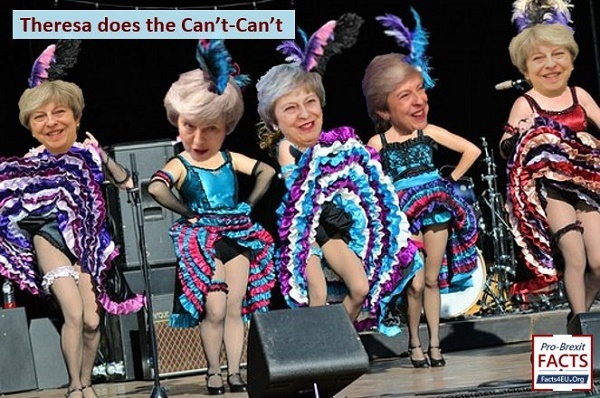 In fact, she might as well have been dancing the can-can for the last two and a half years, for all the good she’s done as Prime Minister. We find it simply extraordinary that for the second time in two weeks the country doesn’t know what its status will be, just two days from now. In the next article we will tell you about what we’ve been doing. In short, we have not surrendered. Please do read our next piece. With two days to go, it matters. Saw this - and almost threw up my cornflakes. as treason may doesn't believe in the democratic vote of the people can we not undemocratically ignore what she is attempting to do to our country and undemocratically dispose of this waste of skin.